A teddy bear show is about to open with displays cleverly created and placed on the tables around the showroom. The doors open and collectors enter, some rush in to meet certain artists being the first to purchase their new bears. Others stand and study their course while still others stroll slowly by the exhibits with eyes wide open. What are the rewards and concerns the exhibitors and promoter experience? What do they learn from each other? Are teddy bear shows here to stay? Are the artists going to stay on the show circuit and be given the opportunity to continue creating beautiful bears? Happy teddy bear collectors in pursuit of 'that' bear. "In interviewing artists over the last few years, I've compiled thoughts on teddy bear show dynamics," says Valerie Rogers of Bright Star Promotions, Inc. Louisville, KY.
Exhibitors and collectors gather prior to the show for dinner. • Interacting with collectors and determining what style of bears they like to collect. • Many business owners don't like sitting in their shops all day. Others enjoy meeting many people and other artists all in a one day, fast-paced show. • Dealing face-to-face with collectors and spinning tales about bears inspires the artist to design! • Exhibitors have an opportunity to see the market first hand and develop new trends, leading to profitable sales. • Many exhibitors enjoy traveling, visiting other artists and sightseeing along the way. • A serious collector asks precise, knowledgeable questions and looks intently while holding the bear. • The browser usually asks simple questions and doesn't want to pick the bear up. • One clue you are dealing with a browser is they'll quickly glance over the table. • Start a conversation which can lead to the browser becoming a buyer. • Always treat each potential buyer the same. • If a customer does not understand what they see, you've created a perfect opportunity to educate them about bear collecting. What is the most difficult part of exhibiting at the teddy bear shows? • Loading and unloading in the snow or drizzling rain, dragging the merchandise and props into the showroom. • Physical exertion setting up the booth area to display the bears. Setting up and dragging merchandise is all part of doing business. • Each showroom has a different table/booth configuration making identical setups almost impossible. • Clearing out of a showroom and packing quickly because another event is planned later that night. Early hours and quick setups are exhausting and rewarding at the same time. • Loud, muffled or constant announcements over the PA system. • Disturbing booth buddies with noisy and active children or playing TV's, radios, live music and singing. • Disheartening thoughts over bears disappearing due to a shoplifter. • Collectors and artists who stand in front of your booth chatting; by doing so they are blocking your valuable sales space. Surely I can squeeze one more thing in the car! How would you describe difficult shoppers? • The customer who doesn't realize the value of collectible bears and insults the artist. • Keep your chin up when a customer verbally puts you or your bear down. • Customers who want to negotiate the price. Before the show set policies for negotiating prices. • Browsers who rough up bears and displays are certainly not desirable. Be patient and distract them or ask them politely to stop their destructive behavior. Dealers what is the most satisfying part of a show? • Going home with only the table props. 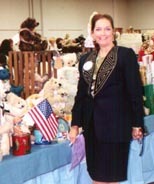 • Selling bears and helping a collector find 'that special' bear. • Being part of a well balanced, well-managed show. • Experiencing first hand what other artists have designed. • Discovering new colors and styles of mohair. • Designing seasonal table themes. • Bear selling is a happy business where smiles abound. • Many exhibitors get excited seeing young people collect. Children are our next collectors. Youngsters love to hear about bears and bear collecting. • Winning recognition for my efforts. • Gifting bears to Good Bears of The World for teddy bear auctions. • Pre show activities like bear making classes or social gatherings. How do you help promote a show? • Send postcards to the collectors who have purchased before. • Announce the show in magazine ads and on web sites. • Link show schedules to other web sites. • Create special interest with the new bears by weaving a story line. • Writing articles and news releases for teddy bear magazines and local newspapers. • Hand out fliers at local businesses. • Accept invitations to speak at schools, civic organizations, TV talk shows and social clubs about the value of collecting teddy bears. • Publish show dates on internet chat lists. • Send eMail announcements to collectors. • Create a need to collect bears. • Notify collectors about published articles where you were featured. • Spark interesting conversations with would-be collectors by carrying a teddy bear or bear purse while shopping. 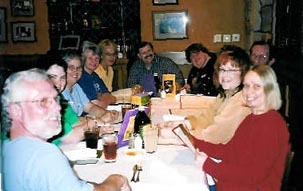 • When dining out leave business cards or show fliers for the server. Valerie unveils collector postcards where artists submitted their bears. Present are 5 of the winners. Example of a winning bear and postcard. • Post fliers in grocery stores, craft shops, antique markets, etc. • Take back issues of teddy bear magazines to beauty parlors, dentist and doctors offices stuffed with show fliers. • Promoting a show is not the sole responsibility of the promoter. • Seeing the show come together in a professional manner. with happy �I've-sold-a-lot' expressions on their faces. • Receiving welcoming hugs from exhibitors. gift to people in need of a hug. • Crowded showroom full of buyers. • Awarding door prizes and gifts to collectors. working with the same staff. • Creating new avenues of effective advertising to inspire the collector to come or come back to the shows. • Designing web pages to tweak the curiosity of the collectors and helping the exhibitors self-promote. • Arriving early to find the show tables have not been set in place. • Response to advertising was not as expected. • Not receiving the required show exhibitors to fill the show. • Request for certain tables by the front door or in corner spaces. There is only one door and usually three or four available corners. • Traveling with tight airline connections. • Last minute changes to the programs or floor plans. Valerie with an arm load of bears for Good Bears of the World. Teddy Bear shows delight everyone involved. Copyright © 1997 - 2007 Bright Star Promotions, Inc. All rights reserved.